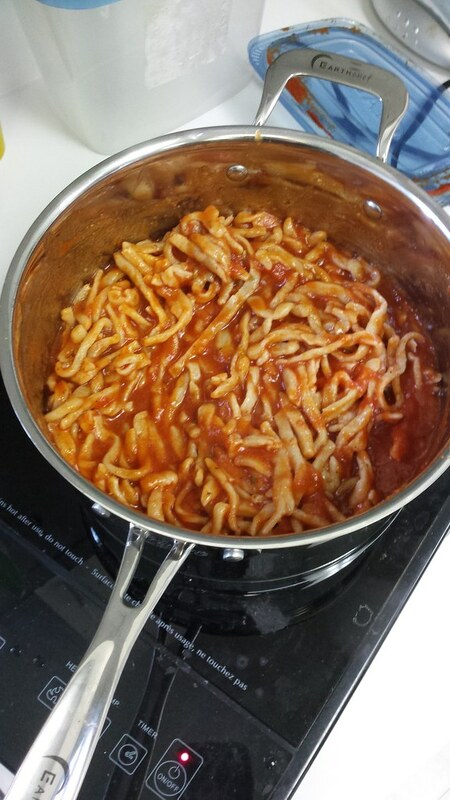 Simple Fresh Pasta with Quick Spaghetti Sauce | What Smells So Good? Combine the flour(s) and salt (and flaxseed if using) in a mixing bowl. With a spoon, create a well in the centre and add the water and olive oil. Using clean hands, knead in the bowl until the ingredients bind together and it forms into a ball. The dough should not be sticky, but should be moist enough to hold together. If the dough is too dry at this point you can add water, ¼ tsp at a time, until the dough is more workable. If the dough is too sticky, add a teaspoon of flour at a time, until dough is workable. Turn dough out onto a lightly floured work surface and knead for 10 minutes, until the dough is smooth. If you find dough too sticky, sprinkle in flour as needed. Form the dough into a ball and dust the surface with flour. Cover with a clean towel and let rest for 30 minutes. After the dough has rested, use a sharp knife to divide the ball of dough into 4 pieces. Shape each piece into a flattened log, generously flouring each side. Pass one piece of the dough through the roller part of a pasta maker, beginning on the thickest setting and going down 1-2 notches at a time to your desired thickness. Alternatively you can roll the dough by hand as thinly as you can. To cut the pasta, re-flour both sides of the dough sheet and pass it through the cutting mechanism of your pasta maker. If you don’t have a pasta maker you can cut noodles with a pizza cutter or knife. Place cut pasta on a cookie sheet coated with flour and dust with extra flour so the noodles do not stick together. Dry for 15 minutes, then transfer to a plastic container and store in the fridge for up to 3 days. You can freeze the dough in the container up to 3 months. Boil for approximately 4-5 minutes, or until pasta begins to float to the surface. If using frozen pasta, do not thaw first (add 2 minutes to the cooking time). In a pot, mix together all the ingredients until well combined. Place pot over medium heat and bring to a simmer. Cook for 5 minutes, then toss with cooked pasta and enjoy!